Sorry for not posting much over the last two weeks! I was away in Portland and California for a week and a half and am currently in the midst of a move. 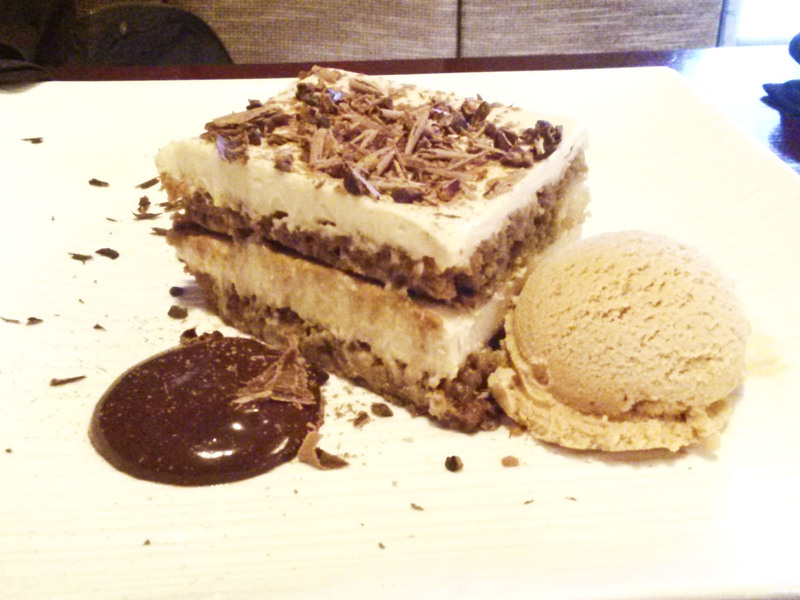 I’m taking a break from schlepping boxes downstairs to share a new post with you. This was a recipe I made a while back and never got around to sharing. One thing that seems hard to find is caramel that’s vegan. I decided to try making some myself. It turned out really well and definitely satisfied my caramel craving! Making caramel seems intimidating at first because you need to use a candy thermometer and monitor the temperature of the caramel. Once you understand how it works and the texture that each temperature produces, it’s really not so hard to make! Whether you end up with a syrup, a caramel, or a hard candy is dependent on how much water evaporates out of the mixture, in other words, how concentrated the sugar is. The temperature will rise as the water slowly evaporates. Here’s a handy guide on the Exploratorium’s Science of Cooking page. 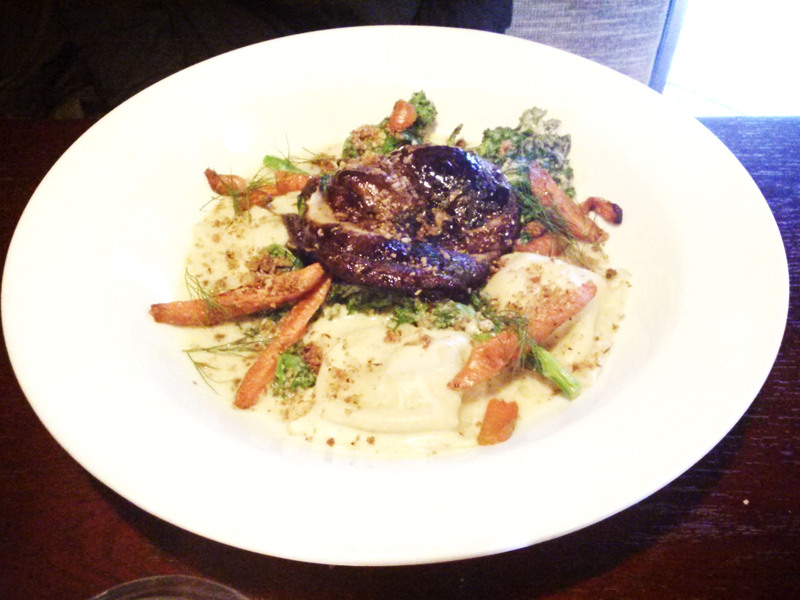 I found this recipe on Group Recipes, but it originally came from The Glad Cow Cookbook. With this recipe, you can make firm caramel candies or a caramel sauce to drizzle on vegan ice cream. I made both out of one batch and they were equally delicious! And I should mention, it’s always a good idea to be extra careful when making caramel. You definitely don’t want to spill the hot sugar on yourself! Line an 8×8 inch baking pan with parchment paper and grease the parchment paper. Place the vegan butter, sugar, soy milk, and light corn syrup in a large pot and cook over medium heat stirring often. The mixture should come to a boil. Monitor the temperature of the mixture using a candy thermometer. If you would like to make caramel sauce, heat the mixture until it reaches 230°. Stir in the vanilla, then carefully pour it into a jar and store it in the fridge. You can warm it by running the jar under hot water before serving. 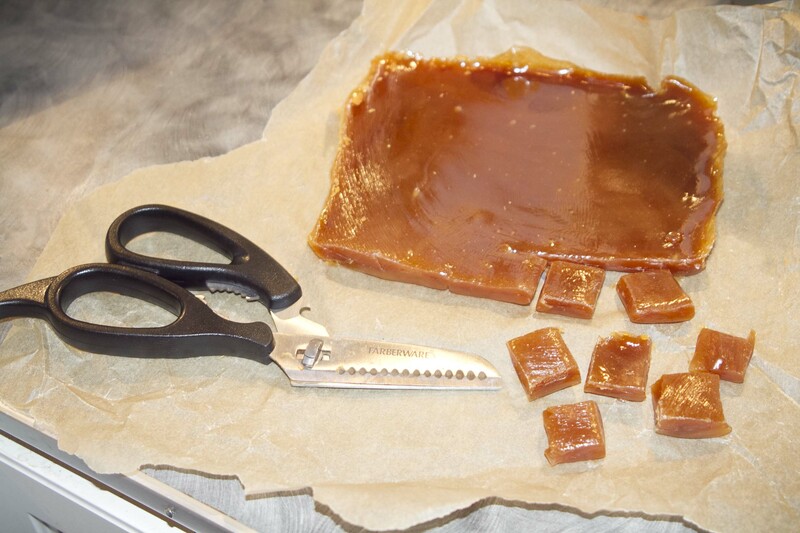 If you would like to make caramel candies, heat the mixture until it reaches 245°. Stir in the vanilla and pour the mixture into the parchment lined baking dish. Allow the mixture to fully cool, then use kitchen scissors or a knife to cut the candies into small squares. Wrap each individual piece in a square of parchment paper and twist the ends to seal. Store the candies in the fridge. Note: You can make some caramel sauce and some candies from the same batch. Once the mixture reaches 230° pour out the amount of caramel sauce you would like, adding the vanilla to the sauce and placing it in the jar. 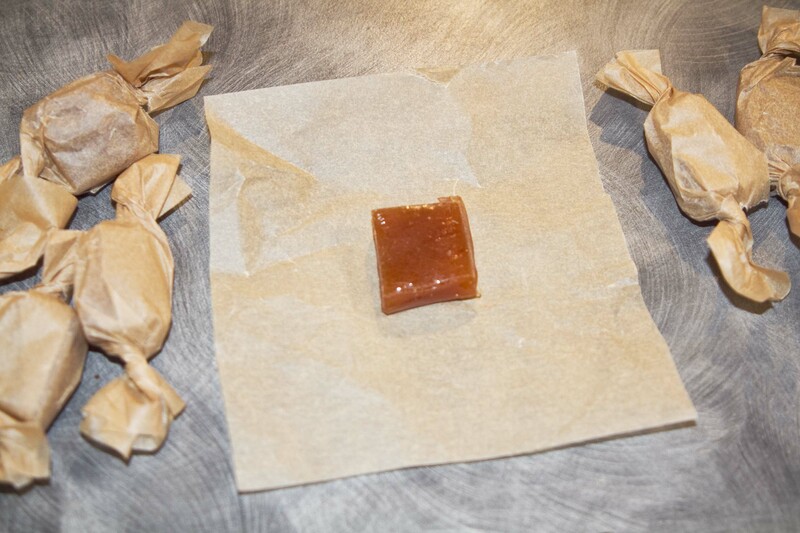 Continue to heat the remaining caramel until it reaches 245°, then follow the steps for making the candies. Happy Fourth of July! It kind of snuck up on us this year. Since it’s been raining nearly every day for the last month it doesn’t feel like summer yet. It’s been hot, but it feels like an extended rainy spring. I can’t believe it’s July already! 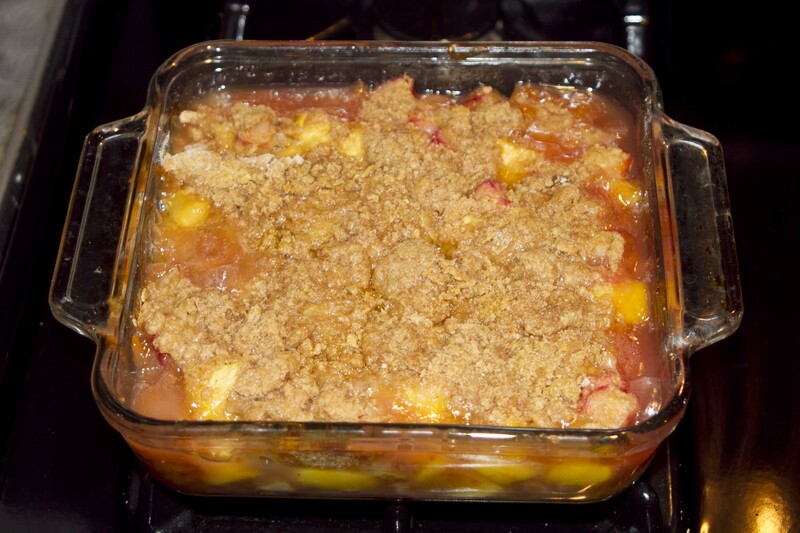 We made a rhubarb and peach crumble to celebrate the holiday. If you’re looking for a last minute dessert recipe, this one is really yummy and pretty simple to make. 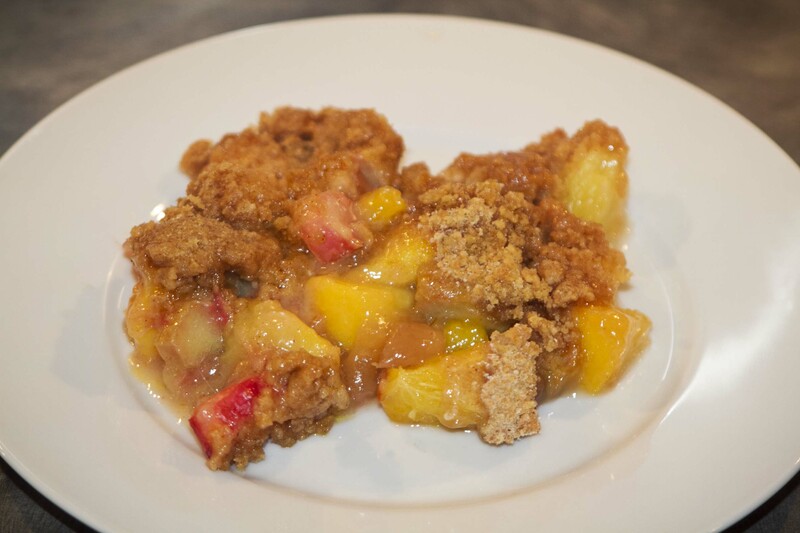 The peaches and rhubarb provide a sweet and tart combo (like strawberries and rhubarb) that compliments the sweet crumble topping. 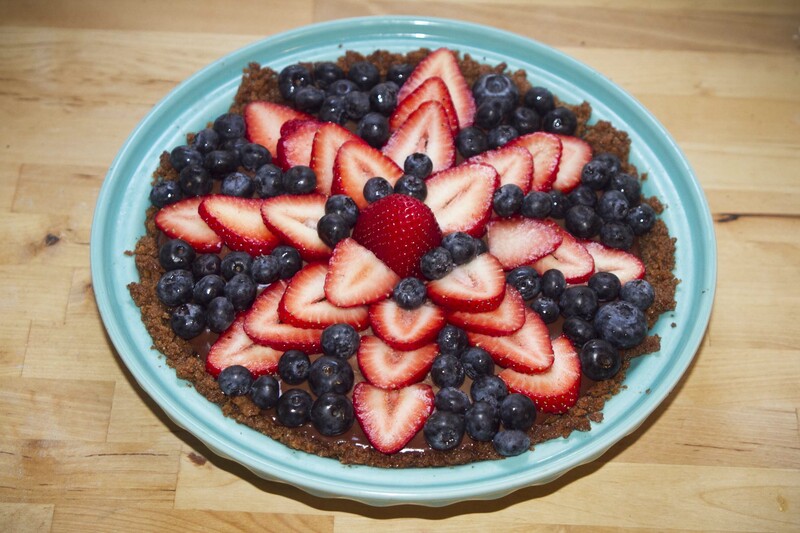 If you’re looking for something more patriotically colored (and chocolatey) try my Chocolate Peanut Butter Pie with Fresh Berries. Add a little vegan whipped cream or vanilla ice cream and you’ll have red, white and blue! Preheat the oven to 350°. Lightly butter the bottom and sides of an 8 inch baking pan. Peel and chop the peaches into about 1 inch pieces. Chop the rhubarb into small pieces. Zest and juice your lemon. Place the fruit, lemon juice, and lemon zest in a mixing bowl. Add the sugar and flour and mix until the fruit is evenly coated. I started with 3/4 cup of sugar and then tasted the mixture. It seemed pretty tart so I added a little more. Adjust the sugar to your own tastes. The sugar and flour will started to mix with the juices from the fruits. In a separate mixing bowl, combine the flour, brown sugar, and cinnamon for the crumble topping. Add the vegan butter in small chunks. Use a pastry blender or fork to cut the butter in. (Sometimes your hands work well too!) The topping should come together in a crumbly consistency, but not as a big ball of dough. Place the fruit mixture in the baking dish. Sprinkle the crumble topping evenly over the fruit. Bake the crumble for 40-45 minutes until the fruit filling is bubbly and the crumble topping is golden brown. When I was in college, I spent summers working in a bakery at a farmer’s market. We made all kinds of baked goods…pies, cookies, muffins, sweet breads. 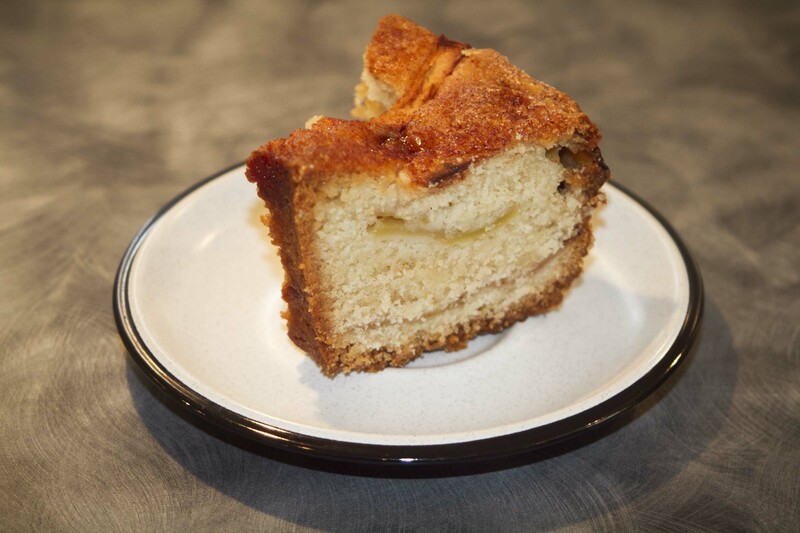 However, my favorite recipe from the bakery was the Jewish Apple Cake. It wasn’t a vegan bakery, and I wasn’t vegan until the end of my time working there. 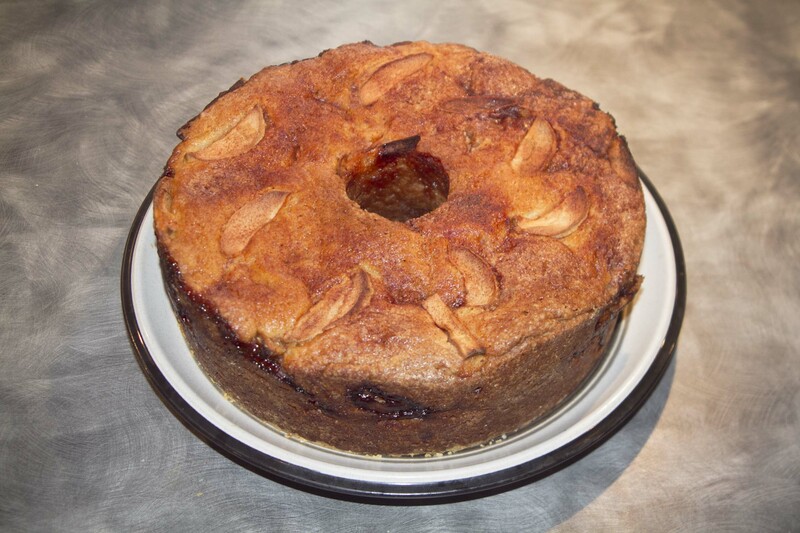 Luckily though, the Jewish Apple Cake is easily veganized by using Ener-G Egg Replacer Powder instead of eggs. The cake didn’t rise up quite as much as it would have with eggs, but the texture was still just like the original. As I was enjoying this cake I realized it would probably work really well with other fruits. Peaches came to mind since they’ll soon be in season. I will definitely be trying this out soon with a peach filling! This recipe makes a big cake, so it’s perfect for sharing. The cake stays moist in the middle and has a nice crispy top from the cinnamon sugar. It’s really a simple, old fashioned recipe, but sometimes the simplest things are the yummiest! Preheat the oven to 350°. Grease and flour a 9 inch Bundt pan. Peel, core, and thinly slice your apples into wedges. In a small bowl combine the cinnamon and sugar and set aside. In a mixing bowl, combine the flour, baking powder, and salt. In a separate mixing bowl whisk together the Ener-G Egg Replacer Powder and the warm water. Then whisk in the oil, orange juice, sugar, and vanilla. Pour a third of the batter into the bottom of the pan. Sprinkle a generous layer of apples on the batter. Sprinkle cinnamon sugar on top of the apples. Layer another third of the batter on top, then another layer of apples and cinnamon sugar. Spread the remaining batter on top. Place just a few apple pieces into the batter and sprinkle the top with cinnamon sugar. Cover the Bundt pan loosely with tin foil. Bake for 1 hour. Remove the tinfoil and bake for another half hour until the top is golden brown and a skewer or cake tester inserted into the cake comes out clean. Covering the cake for the first hour helps to keep the apples on top from burning. The cake slid out of my Bundt pan pretty easily, but if you can’t get it out, you can always serve it from the pan. It does make a nice presentation when it’s out of the pan though! 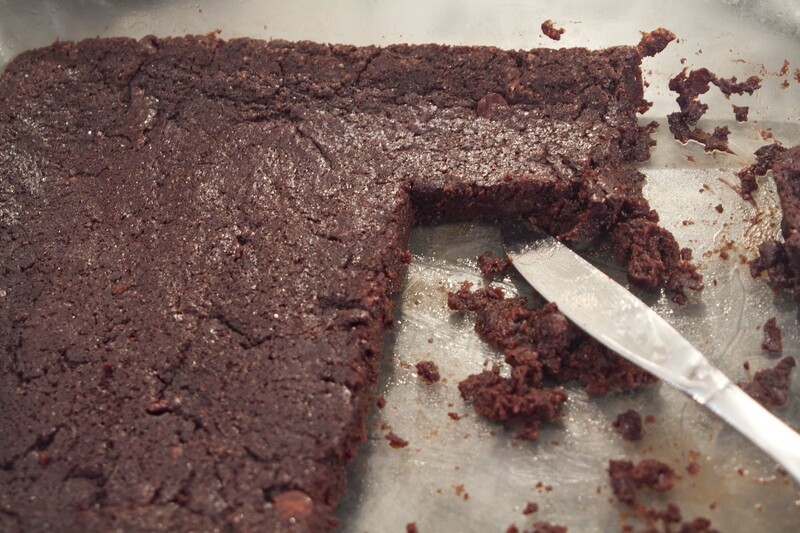 I’ve tried various vegan brownie recipes that I haven’t been thrilled with… I know, how do you mess up brownies? But the texture would always be off, or they were crispy and I couldn’t get them out of the pan. 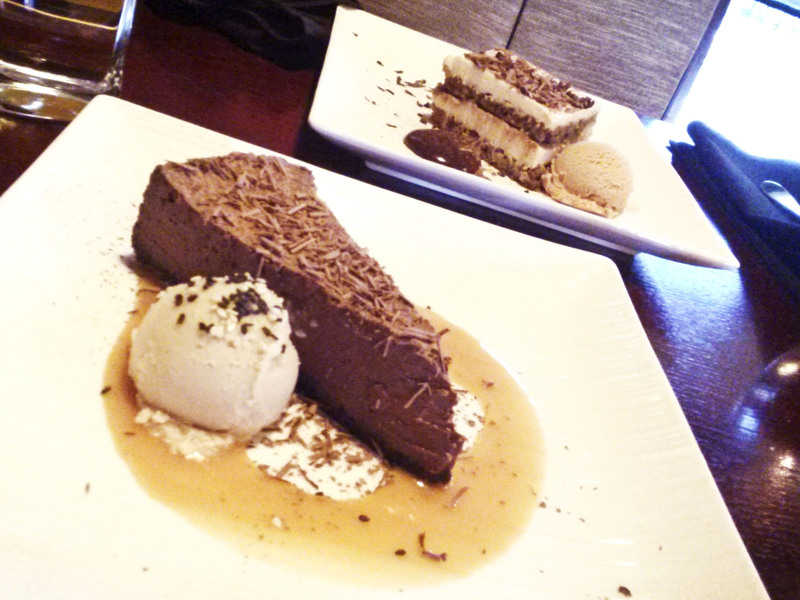 I had a chocolate craving the other night though, and I finally found a recipe that actually came out pretty well. I might tweak it next time by using a bit less oil. I ended up adding a little extra cocoa powder because they seemed too wet from oil, but otherwise they turned out well. They were easy to get out of the pan, and they were fudgy and soft like a brownie should be. The recipe came from All Recipes. They were so yummy I didn’t wait to get a photo of the whole pan as you can see. We just dug right in! If you have a favorite vegan brownie recipe, share it in the comments! In a mixing bowl, combine the flour, sugar, cocoa powder, baking powder, and salt. Then add the water, vegetable oil, and vanilla. Stir until the batter is completely combined. Add the chocolate chips and nuts if desired. I just used chocolate chips in this batch, but I like walnuts in brownies too. Pour the batter into a 9×13 inch baking pan and smooth it out. Bake the brownies for 25-30 minutes until a knife poked in the center comes out clean. Let them cool down a little before cutting them up or they’ll fall apart. Enjoy! Welcome to the third Virtual Vegan Potluck! It’s been great to see this grow so much each time! In case you just happened upon my blog and don’t know what the Virtual Vegan Potluck is, it’s a blog circle of recipes by vegan and vegan friendly bloggers. You can start at the beginning by going to Vegan Bloggers Unite, or see the blogs before or after me in the potluck by following the Go Forward and Go Back links at the bottom of this post. I’m excited to be participating again, and I’ve brought one of my favorite dessert recipes to share! This recipe originally came from Vegetarian Times many years ago, and I’ve made a few modifications to it over the years. This pie is pretty easy and quick to make, and it’s perfect for sharing! Who doesn’t love peanut butter, chocolate, and berries? I wish I could give each of you a slice in real life! 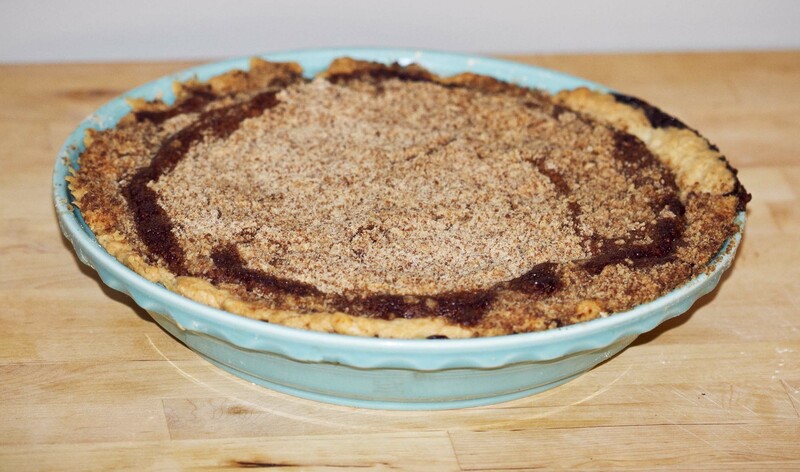 I make the crust from scratch because many store bought graham cracker crusts aren’t vegan. Most graham crackers contain honey, but Nabisco Originals don’t. Making a graham cracker crust from scratch isn’t too hard and doesn’t take much time. I think they’re tastier than the store bought versions too! You can also use ginger snaps, vanilla or chocolate wafer cookies, or any other type of cookie or cracker that is dry and crumbly to make a crust. That’s one of the things I like so much about this pie, it’s easily customizable. 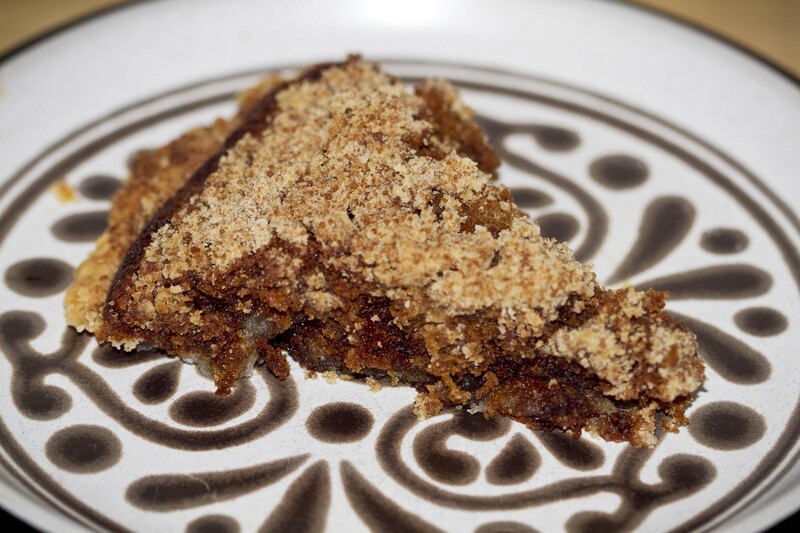 In addition to changing the flavor of the crust you could substitute almond butter or cashew butter for the peanut butter, and you could top the pie with anything you like – nuts, vegan whipped cream, bananas, etc. Make it your own! Place the graham crackers in a ziploc bag and seal it shut. Use a rolling pin or a wooden spoon to crush the crackers into crumbs. Pour the crumbs into a mixing bowl and add the sugar, salt, and cinnamon to the crumbs. Stir until combined. Melt the vegan butter and drizzle it over the crumbs. Mix it with a fork until combined. Pour the crumbs into a 9 inch pie plate. Press them into the bottom of the pie plate and up the edges. They should stick together. If any holes form, make sure you fill them in. Bake the crust for about 10-15 minutes. If the sides of the crust slouch down after baking, gently use the back of a spoon to push the crust back up the sides of your pie plate. Let the crust cool fully before putting the filling in. 1. In a food processor or blender, combine the silken tofu and maple syrup and blend until smooth. Add the peanut butter and blend it again until it’s smooth. 2. Melt the chocolate chips, either using a double boiler or heating it in 30 second intervals in the microwave until melted. Stir the chocolate frequently as it melts. Add the melted chocolate to the food processor or blender and blend until smooth. Pour the filling into your cooled graham cracker crust. Smooth the top out and refrigerate the pie at least 20 minutes to firm up. 4. Place the berries on top (or use your topping of choice). You can use fresh berries when in season or thawed frozen berries other times of the year. Keep the pie refrigerated. Enjoy! Be sure to check out the rest of the potluck by following these links! The blog before me is Mama et de Bebe Hawk and the blog after me is Deerly Beloved Bakery. 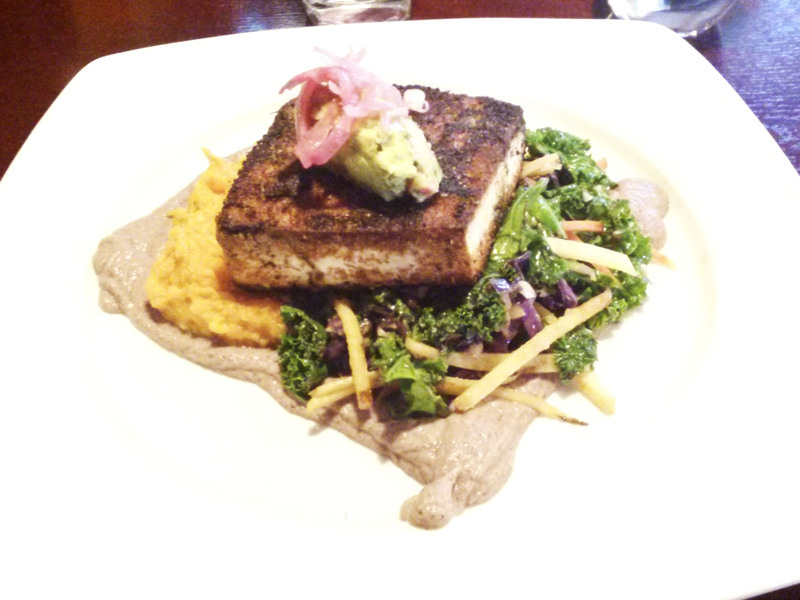 You can also start at the beginning by visiting Vegan Bloggers Unite!